Then I was thinking it was kind of like pottery, how you spin a pot and throw some glaze on there and put it in the kiln and it comes out looking shiny. But that’s not quite right either, because you pretty much know what a pot is going to look like when it comes out. As an agent, I have heard many authors say that seeing the cover was when the whole publishing process seemed “real.” And now I see what they mean. It does seem more real. I had always thought it felt “real” for writers because the cover made the whole thing look more like an actual book. And yeah, that’s probably a part of it. But that’s not really how I experienced the “real” thing. There was more to it than that. Up until that point when you see the cover, it’s difficult to imagine that someone else reading your book will have a different imagination of how things look and feel than you. As a writer, you have a certain idea of the physical and artistic aesthetic of the book: what the characters look like, which parts of the book comprise the essence, and what people will take away from it. So when you see the cover for the first time, at first there’s inevitably a “Whoa, this wasn’t how I was picturing it.” And of course it wasn’t how you were picturing it! No one is going to interpret a book the same way you do, even though you wrote the darn thing. But then, when the cover is good, there’s quickly a dawning that it captures the essence of the book. It’s not your imagination you’re seeing represented… and yet it is. It may not be how you physically pictured it, and yet there’s something there that is so so so right. The real metaphor, I realized, is that the cover process is kind of like a physical manifestation of the writing and reading experience itself. People are out there reading your book, and they’re not picturing the same castle that you were picturing when you wrote it, and they’re not imagining the characters looking the same way as you were, and they’re not seeing the same fields and mountains. What’s happening in the minds-eye is unique to every reader. And yet despite those differences, there is an essence that binds the writer and reader, a shared kernel that is hopefully passed through the words. We don’t often get those different interpretations drawn out for our viewing pleasure, but when the cover comes along, it’s “real” because it’s a reminder that a book isn’t all yours anymore. It will soon belong to readers, who will picture a different character and world than you were picturing, while hopefully absorbing the essence what you were truly going for. I couldn’t be happier with how the cover for JACOB WONDERBAR turned out!! When I saw these characters illustrated I couldn’t believe how well they were captured. Thank you so much to Christopher S. Jennings for the illustration and Greg Stadnyk for the design! The apropos metaphor I know is "An illustration is worth a thousand words." Applied to a novel, it might just have cost what the thousand words it depicts will earn. It's funny because your cover kind of reminds me of a cover of a board game. Maybe it's all the bright colors, but either way, it definitely looks like an exciting read! Congratulations. The cover looks fantastic. Making it REAL by seeing the cover? Indeed. One day I will know that feeling and will be back to share. This brought back a lot of memories for me (good ones) and I am so happy for you and proud of you. Now you're a real author – congratulations! Looks awesome, Nathan!! Congratulations again! Congrats on your first cover! Yay! My first books arrived at my house when I was at an RWA conference. I told my husband he was NOT allowed to open the box, no way, no how. Not until I saw them. My first hands-on experience was in the massive ballroom for the Literacy book signing. I remember wending my way through the room, reading the author names, looking for mine. That was cool enough, but then I got to pick up my books. I think finishing the book is like childbirth, but holding it is like when your baby looks at you and smiles for the first time. Fun cover. It looks great. I'd think you must feel very proud. It really is a fun cover. Congrats, Nathan! Congratulations, Nathan! The cover for JACOB WONDERBAR is awesome. I know exactly how you feel. I’ve had 14 books published with exquisite book covers. Even when the covers weren’t exactly what I had imagined beforehand, most of them took my breath away and all of them made me very happy. Looks fun and cute – an absolute blast! (So to speak. 😉 I think it would really appeal to my kids. The illustrator captured the characters so well that I actually now picture the illustrations when I imagine the characters. So yeah, definitely very influential. Your cover looks great! Congratulations! I didn't have that 'problem' with the cover because I designed mine; I kept creating drafts and versions until something 'clicked'. It does make everything seem so real! I can't WAIT to get my hands on my own ARC. I don't think anything else will matter then. Just me and my baby. It's just that… my publisher hasn't set a solid, day/hour/minute due date. It's like…I know what my baby will look like, and what "she's" called, but I haven't given birth to her yet. Totally terrific cover – perfect for that age group. I think what you are saying in this post is subtle, and you say it very well. It rings true. I was just thinking this the other day – once you put your words out there, other people will do with them as they will. You lose control. . I can imagine that something as concrete as a book cover really brings it home. Those words have left home and are making a new life for themselves in someone else's head. But either way, you have a brand new baby book! He's darling and very handsome. Mazel Tov, Nathan! it looks INCREDIBLE. i can't wait to read it! Nathan, I like it. I don't know what you had in mind, but this catches the eye! And if anyone is in opinion mode, here's one I designed, for a title I may self publish. Opine away, please! Too much? Not enough? Wowser, young Nathan, you got a stunner!! I'm a little over 18 myself and I want the dmn book! Great cover! Very fun. Why don't you represent mg though you can write it? I do rep middle grade, though as an agent I tend to gravitate to older kids' books. But please do think of me with middle grade. How much did they consult you on the cover? Usually there's some give and take. I LOVED the cover the artist did for my first book. The second one… I didn't want to be rude, so I didn't reject it, but it wasn't as good, and I think it cost me sales. Today I had the interesting experience of revealing the cover for my short story anthology… for which I was also the cover artist. Since it's an anthology, though, the cover doesn't really show any particular characters, it's more a matter of mood. But it's funny, because when you are both artist and author, you miss that aha! moment of seeing your book through someone else's eyes. Congrats, Nathan! it looks great! My first glimpse at my first cover with Penguin/Razorbill was actually a comp, only they neglected to tell me what "comp" meant, and the terrible stock photos scared the heck out of me. Heart-attack inducing, I tell you. I received covers number 4 & 5 in the last two months, and its still just as exciting as the first one! Congrats on the cover!! It's adorable. And I like your metaphor about it being a manifestation of the experience. It's also the first time of letting go – when everyone else gets to have THEIR interpretation of what you wrote. It no longer belongs just to you (or your editor, or your crit partners, who already love you and it). Your cover rocks, Nathan! And, believe it or not, when you get your first copy, your book will smell like a newborn too! I appreciate what you shared here. Congrats on your cover, wow!! Exciting! Ahh, love it! It's so cool and fun! Congrats! It's a great cover. But I agree that next time, they've gotta make your name bigger. You've described it perfectly–that high you get when you see your first cover or hold your own book in your hands for the first time. Other people are now coming into your lonely writer's universe. It's a kind of terrifying joy. Awesome title, awesome cover. Congrats, Nathan. That is an awesome cover, Nathan, and definitely a timely posting for anyone else about to see their cover for the first time, too. Congrats! The cover looks great. Love the cover. It would have made my kids want to read it. I am having a bad book cover experience. We are now on to version three. The first two had characters on the front that were wrong. One was totally the wrong age. With only 2 weeks to release day I'm not stressed that my book is still naked. I'm glad you love yours. Aaaahhh, love the cover!!! I'm such a cover junkie. I'll buy a book I already own if it has a new cover. It's that bad. Congrats, btw! I hope to one day feel what you must be feeling right now 🙂 It just seems so freakin' exciting! I bet the next best part is when you hold the book in your hands and stroke the cover lovingly. I am a ceramics artist, (and teacher) so let me tell you that your use of ceramics as an analogy really is not off at all. Many times you don't know exactly how your ceramic work will turn out when it comes out of the kiln, and many times it turns out quite different than what you thought. It's especially true for the uncounted numbers of Middle Schooler I've had over the past twenty years. Congrats on the cover and the "real" step! And yeah – though I have only read what you've shared on this site, that's not how I pictured the cover either. I didn't expect it to be quite so comicbook-y. Looks good though, great attention grabber! Like all "babies", their made up of a collective gene pool. What we get is what we need, and the we just love it. The experience of seeing my book cover for the first time was frawesome! (hybrid of fricken&awesome). I was really happy with the cover for my debut middle grade novel Dead Frog on the Porch. Your cover looks great! Congratulations, Nathan. The cover looks terrific. Congratulations. The cover looks great. I love your explanation of how the cover is so symbolic of this really not being yours and only yours anymore. Now it will belong to many others to enjoy, and that must be super exciting. God, I hate to admit this, but I actually teared up a bit when I clicked on it and enlarged it. I can only imagine what it must feel like, given all it takes to actually create, write, revise and ultimately publish a novel. I can't imagine any author not getting excited about their covers. But you certainly have a lot to get very excited about. That's a great cover!! Well, all I hope for is red with gold lettering on the inside cover under the dust jacket of the hardbound edition. So anything past that would be a wonderful blessing. Congrats, Nathan. It's a fun cover and will stand out on the shelf (and will appeal to boys and reluctant readers, which is fantastic!). I like that a lot. I really enjoy the Percy Jackson series and I'm curious if this is along the same targeted age-range, etc. Just wondering. I don't mean to ask you to compare yourself (which must be annoying). If it is kind of along that wavelength, I'll buy it. Ooh, what an awesome cover! I can't wait to read your book when it comes out! I don't know if it works as a metaphor but your question reminded me of how people wonder, when they're young, what their future spouse will look like, and how they're completely oblivious to the fact that they've just met that person when it finally happens. Congratulations Nathan and how exciting! i think it looks like a fun book! My editor just sent me ideas for my cover. It's so amazing to realize people are responding to my work. Can't wait to see how those ideas are handled by the illustrator. Thanks so much, everyone! anon, yes, it's a middle grade adventure so somewhat similar age range as Percy Jackson, though a different style. Joanna, it comes out next May. Way cool cover, Nathan. Congratamalations! Definitely makes me want to pick up the book and give it a read. Congratulations, and I know what you mean by the feeling of "realness" on seeing the book cover for the first time. So far I've been part of short story anthologies, so the book covers do not reflect my story…but the day I have my own book, I can imagine feeling what you felt about the interpretation of your work in a way you as the author had never imagined. it's true! Even having had input into my first two book covers, I was surprised at the effect of actually puttign a cover on the book. With my next one, the publisher has full control of the art, and I'm both nervous and thrilled to see what will happen 🙂 Congrats on your gorgeous cover – definitely eye ctaching! A major difference, of course, with self-publishing is you actually have far more control over what your cover looks like. I feel advantaged being able to create my own covers, just as I do being able to write what I want and how I want, without having to make any compromises or changes. And, as with birthdays, let me be one of the first to suggest…"and many more…"
That's so true it's not even funny. I hope I can experience that one day. Glad you got to experience it with your work. It looks really cool, great design and, got to say it seems like it'll be funny. I should hope it gives a marvelous impression of the book as a whole. Congratulations on the great cover! To me seeing the cover for the first time is like talking to someone over the phone for years and then finally getting to meet them in person. My 7 year old daughter was looking over my shoulder as your cover was on the screen and she is now very excited to read the book. Jacob Wonderbar! Got stuck on you. Like it, your casual but informative (and mildly authoritative) style. QUESTION: In round numbers so as to not give away trade secrets, what can we self publisher hopefuls count on as the cost of a first rate cover? Rules of thumb? I can't completely understand the feeling that you are describing. I do have two beautiful children, which I feel in love with instantaneously, and that is something that I can put into perspective, but I haven't made it too far into the publishing process and have a long road ahead. One thing that I have noticed about myself is that I do imagine cover art. As I write I catch myself day dreaming and often I have found myself picturing exactly what I want the cover to look like even though I realize that could be considered putting the wagon before the horse. However, if I don’t dream it then it will never happen. Anyway, congratulations on your success and I look forward to reading a copy with my eight year old son and my six year old daughter, who are two of the cutest children alive, not that I’m partial. Interesting thoughts as always. The challenge is in the cover reflecting what you meant to convey in a manner which will appeal to readers. They are the guys who decide the fortunes of your book. The cover is the first adaptation of your story by someone else. The first of many, since every reader will use your novel as a script for the movie he or she makes in his or her own head. I totally hear ya about feeling a loss of control sending your work out into the reading public. I always worry that my racy romances will carry too much of my politics over. Now I worry that the message will be totally mis-interpreted. Bui that's the sign of good writing, yeah? That everyone sees it in their own way. I don't envy cover artists. What responsibility! Congrats, Nanthan. The cover looks enticing enough for a kid to pick it up and pull on Mom's sleeve. "I want this one, Mom. Please?" And yep, there's nothing like a story born onto paper that came out of your own brain and fingertips. It's a unique thrill. Then the pain of publishing suddenly takes a back seat. I'm going to buy it for myself. Enjoy the champagne! This doesn't really apply to those who design their own cover and do character sketches. But interesting anyway. Congrats on the cover Nathan! I hope you soon get to enjoy holding the book in your hands for the first time! What a pleasure it is to share through your own happy experience the potential pleasure of seeing someone else's visual reaction to one's own writing. Your cover is like a visual query for potential readers. It doesn't have to be a perfect representation – all it has to do is entice someone to open the book. I'd open yours because the design makes me think of nifty shows like ROCKY AND BULLWINKLE and FUTURAMA. And I like the kids' expressions, irrepressible with a healthy dash of mischief. Then there's the fact that your illustrator used a li'l NB orange. Bonus. Big congratulations, Nathan! You're proof positive that putting good things out there in the world can come back in the best possible ways. It's "Real", Jacob should be proud of you. Congratz, Nathan. I love that cover. I can only imagine how it feels to see your own cover (although the feeling you described is somewhat what I expected), but I love the cover! It looks great and seems to capture what you have told us about the book. The cover has a lot of fun and energy about it. And has already enticed potential readers by the sound of it. My first cover for Tail Of The Sea Witch, done by Ardy Scott, was such a thrill – it was everything I could have imagined for a children's fantasy set around the Sapphire Sea. Congratulations! Your book sounded fun to begin with, and the cover magnifies that. I`m looking forward to it! Actually, it looks just like I imagine you: oozing energy, irresistibly inviting and most of all happy. I'd say the illustrator and designer not only captured the essence of the book, but the soul of the author as well. I remember when my publisher told me one of the top Dutch illustrators – Philip Hopman – had been asked to illustrate my first one – Deedee's Revenge – I was in total awe. Philip did what these two guys did: capture every essence of the book. Even after 5 years it still makes me happy just looking at it. How exciting! I think it's a brilliant cover and an even better title! If every boy in the library/book shop doesn't pick it up I'll be amazed! Years ago a friend of mine with a fantastic voice sang with a really good band. I wrote music back then, both lyrics and melody. To hear one of my songs, sung beautifully by her, accompanied by all those musicians and then to hear the exclamation point of applause…ah…I know exactly how you feel. It is one of those moments you will always remember. Ain't life grand? That's a very cool cover. It definitely makes your book look like a fun read. Bravo! You've put into words the very essence of what a good story is; something different for everybody. I always felt that an amazing writer is one that can make the majority picture the same or similar scenes. But even that cannot be etched in stone. Congrats on your cover. It is a cool one! Windmill, somewhere on J.A. Konrath's blog is the name and email addy of his cover artist. Take a look at the style, see if it suits you… I believe, Konrath initially stated his cover cost $300, no doubt they've gone up now. You might visit sites like Deviant Art or Concept Art… (artist's styles and contact info is given) be prepared, you're gonna see some "out there" stuff, but some of these folks might be interested in doing a cover for you. Working digitally, you can always "tune" things down, or up, for that matter. You might google book cover designers, I'd stick with digital art, all you get is a thumbnail which is a simple upload, and resolution/size requirements can be obtained by inquiry – just a thought. Congratulations! That's so exciting! I can't even imagine how it must feel to see your cover for the first time…goosebumps! Just goosebumps 🙂 I agree with anon 9:31 p.m. – very well said. The cover itself is so cute and fun – it will definitely appeal to kids. Heck, I'd want to read it and I'm in my 30s. A great cover, Nathan. Congratulations! You mentioned that the reality of seeing your book cover is that it's "a reminder that a book isn't all yours anymore. It will soon belong to readers." Writing seems so personal. The novel as baby metaphor really resonated with me. My manuscript is yet unpublished, I suppose it's still in the womb, and I can't wait to see how it will eventually turn out! But, your remark was totally on-point. I teach college and often my class of freshman will get hung up wondering what an author meant. Authorial intent, as we know, can only get us so far. It is the readers' job to interpret and make meaning from the words. Your cover looks great! Congrats!!!! My first cover, from the publisher I pulled the book from for other (but related) reasons, was clearly made by an intern with a (small) Getty Images budget. It was truly depressing and awful. It would have been embarrassing if it had come out with that. 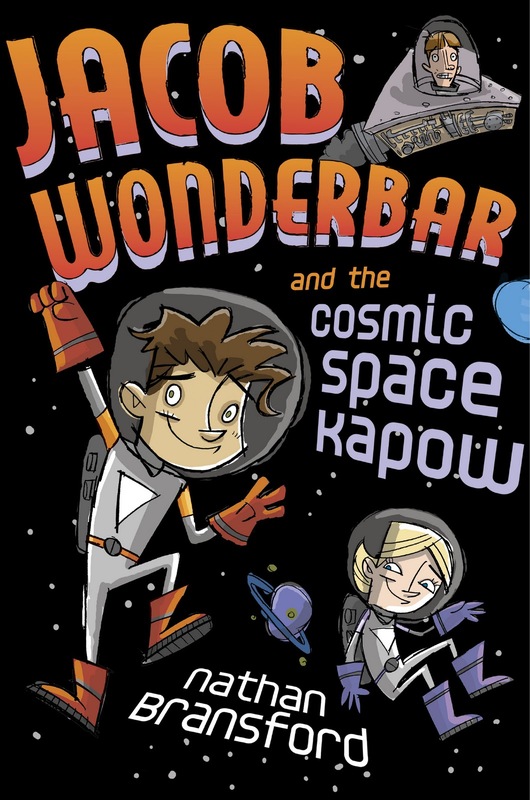 Great cover for Jacob Wonderbar! I saw my cover for the first time this week, and it was so different from anything I'd imagined that it took me an hour to realize I love it! Your cover looks great and most importantly, I'm glad you love it. When my husband and I took the plunge and "merged" our books (blech ereaders…I love our library!!) I was taken aback by how awful the cover was for his version of Narcissus And Goldmund and insisted we give his away and keep mine for the library. I'm the exact same way with coffee mugs. They have to have the right artwork and texture/feel for me to really enjoy my cup of coffee. Congratulations, Nathan, on the 'coming out' of your book. Looks great, and it's visually appealing for the MG level. I'm looking forward to that same feeling of pride and awe one of these days. No matter how many times this happens, it's still new and wonderful. Enjoy every moment! Congratulations on the cool cover! I can't wait to read it. And thanks for sharing your experience. But this post re-opens the e-book vs. real book debate. Seeing your e-book on your e-reader can't begin to match the experience of holding your own book in your hands, feeling its weight. I just want to state for the record that Pottery may be a more apt metaphor than you knew. True glazes change from chalky nothingness to popping color in the kiln, and they also move around on the surface in surprising ways. You don't, in fact, know what they look like until it's back in your hands. It looks fantastic, Nathan. Congrats! I assume it sets the tone for the book–that and the title. I like it. It reminds me vaguely of the cover art for the Captain Underpants books. Super cool cover, Nathan! 🙂 Looks like a neat book, hehe. Congratulations, I'm so happy for you. Wishing you tremendous sales and a spot on Oprah's couch! Congratulations. I love the cover; it is cute. Where do you find time to be an agent, blog, manage a forum for writers, and write a book? Kinda adorable, Nathan! =) Congratulations! You describe the feeling perfectly. It's probably the first time you realize that the book is no longer just "yours." Part of it now belongs to the illustrator, just like soon it will belong to the readers. It is a bit like parenting. We bring them into the world, but once they are here, they have lives of their own, no matter how much we love them. When my Author (who I did not know prior to the release of our first book) got her Authors copies, she emailed me. She attached a photo of herself, taken at the same age as the PB's main character. She, looked just like the little girl I had drawn, down to the same curly hair and hair style.